Ní neart go cur le chéile. Congratulations to Michael Farrelly, Cillian Hughes, Arlene Shannon and Michael Putnam who were winners in the recent Gypsum Saint Gobain Art Competition. 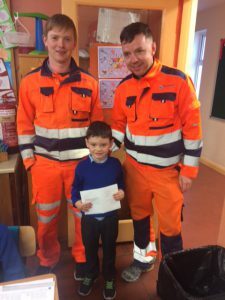 Pictured here is Cillian Hughes, receiving his €25.00 All For one voucher from 2 Gypsum Employees.